This book is a history of the Volunteer movement at the Universities and Public Schools under the title of the Officers’ Training Corps. The Corps was once described as the “spoilt child of the War Office.” Since August 1914, however, it has supplied over 20,500 officers to the army. Alan was at the OPS as a boy from 1888-90. He won a scholarship to Charterhouse, where his father was headmaster, and thereafter he became the first of our old boys to attend Cambridge University (Pembroke College). Alan became a schoolmaster and in 1906 took command of the Lancing School Corps. 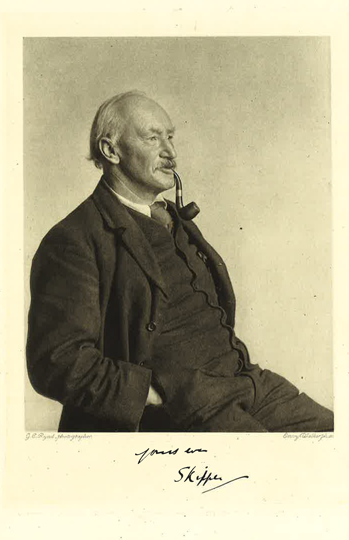 In that role he attended a meeting at the War Office, where Sir Edward Ward, with Lord Haldane in attendance, presented his suggestions for change. Rather than the University and School Corps be attached to the local Volunteer Battalions, they would now become the senior and junior divisions respectively, of a new Officers’ Training Corps under the direct control of the War Office. At Lancing, one way or another, Alan Haig-Brown persuaded every boy to volunteer for the OTC, making them, it is said, the only school with 100% participation. Clearly, without these important changes, which were made in 1908, we would not have been able to combat Germany’s aggression in 1914 so swiftly. Although Alan is referred to above as Captain Haig-Brown, the London Gazette confirmed last week the rank of temporary Major. 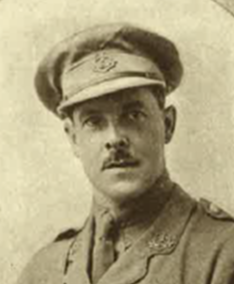 He is to be the second in Command of the 23rd (Service) Battalion, The Middlesex Regiment (2nd Footballers). Alan is well qualified for this regiment, having won a footballing Blue at Cambridge in 1898 and 1899 and played seven games as an amateur for the Southern League side, Tottenham Hotspur in 1901-3.